Coat of Arms of the Fieschi family. 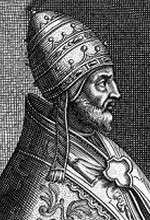 Pope Adrian V (Latin: Adrianus V; c. 1210/1220 – 18 August 1276), born Ottobuono de' Fieschi, was Pope from 11 July to his death on 18 August 1276. His first clerical position came in 1243, when he was created a papal chaplain. Subsequently he received several ecclesiastical benefices, becoming archdeacon in Bologna (1244) and Parma (1244/48–1255), canon and chancellor of the cathedral chapter in Reims (1243–1250), canon and dean of the chapter in Piacenza (c. 1247) and canon of the cathedral chapter in Paris (1244/45–1270). In December 1251, he was created Cardinal Deacon of San Adriano by his uncle Pope Innocent IV. He was also archpriest of the patriarchal Liberian Basilica (attested from 1262). He was sent to England in 1265 by Pope Clement IV to mediate between King Henry III of England and his barons, and to preach the Crusades. He remained there for several years as the papal legate, serving from October 1265 to July 1268. His diplomatic position was such that his name is still on the oldest extant piece of English statute law, the Statute of Marlborough of 1267, where the formal title mentions as a witness "the Lord Ottobon, at that time legate in England". (Also on this legation was a young diplomat, the future Boniface VIII.) In April 1268 he issued a set of canons, which formed the basis of church law in England until the Protestant Reformation of the sixteenth century. Fieschi was related distantly, by affinity, to Henry III; his sister had married Thomas II of Savoy, who was a cousin of Henry's wife, Eleanor of Provence. In the Divine Comedy, Dante meets Adrian's spirit in Purgatory, on the level reserved for the avaricious, where Adrian atones for his sin of worldly ambition. (Purgatorio XIX, 88-145). ↑ One or more of the preceding sentences incorporates text from a publication now in the public domain: Chisholm, Hugh, ed. (1911). "Adrian". Encyclopædia Britannica. 1 (11th ed.). Cambridge University Press. p. 216. Herbermann, Charles, ed. (1913). "Pope Adrian V". Catholic Encyclopedia. New York: Robert Appleton Company. Francesco Cristofori, Le tombe dei pape in Viterbo (Siena 1887). Natalie Schöpp, Papst Hadrian V (Kardinal Ottobuono Fieschi) (Heidelberg; C. Winter 1916). Ludovico Gatto, "Adriano V," Enciclopedia dei papi (ed. Manlio Simonetti et al.) Vol. I (Roma 2000), pp. 425–427. Maxwell-Stuart, P. G. Chronicle of the Popes: The Reign-by-Reign Record of the Papacy from St. Peter to the Present, Thames & Hudson, 2002, p. 117–118. ISBN 0-500-01798-0.